Midwestern waterfowlers looking to scratch their early-season teal itch in Michigan, Wisconsin and Iowa will be able to do so for the first time in nearly 50 years this September. The U.S. Fish and Wildlife Service (USFWS) authorized the states' implementation of an experimental blue-winged and green-winged teal-only season after an agency study revealed that teal populations would be able to tolerate the extra pressure. Minnesota chose to opt out of a trial season in 2014. Originally annexed in the late 1960s in an effort to protect the area's role in waterfowl production, the northern block states' teal hunters are afforded the opportunity to occupy their blinds early this year with one caveat: They will be observed by the FWS. All success of the experimental reinstallation of the season depends on hunters' ability to specifically target, and attempt to target, teal only and avoid harvesting non-target species. Each state participating in the trial will be required to place departmental wildlife staffers in observation blinds to record the percentage of non-teal ducks taken in the field. "There are a lot of brown ducks flying around at that time," said Barb Avers, a waterfowl program specialist for the Michigan Department of Natural Resources. "Not only teal but mallards. When they are not all colored out, they look the same. Wood ducks are also a concern." If more than 25 percent of observed attempts targeted non-teal species, or the total recorded harvest exceeds a 10 percent threshold of non-teal kills, the season will be immediately terminated. The responsibility of ensuring future seasons lies on hunters' abilities to know their species and positively identify a teal before pulling the trigger. Teal, especially blue-wings, are one of the earliest ducks to migrate south, and hunters will have their work cut out for them when trying to distinguish a fast-moving teal with eclipse plumage from a mallard or black duck hen, or a wood duck in low light. According to the USFWS annual waterfowl forecast released earlier this summer, teal populations are thriving in 2014. Blue-winged teal estimated abundance is 8.5 million, surpassing the 2013 estimate of 7.7 million, 75 percent above the long-term average. Daily bag limits are set at six across the board, but hunters will need to check the specific dates and shooting times for the state they intend to hunt in. Michigan and Wisconsin have proposed seven-day seasons that will be open September 1-7. The Iowa teal season, on the other hand, will run September 6-21. In Wisconsin, shooting hours on opening day will begin at 9 a.m. and close at 7 p.m. to afford observers the ability to properly conduct surveillance. Shooting hours will be from sunrise to 7 p.m. for the remaining days of the season. Teal hunters are encouraged to study up on their duck identification to secure the convenience of future seasons as well as share the new occasion with young shooters when September's mild weather is ideal for introducing new guns to the sport. 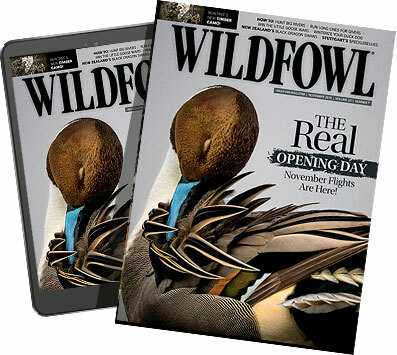 Be sure to pick up a copy of the October issue of WILDFOWL for a more in-depth look at the experimental new season.